Following the long-term success of The Leadership Warrior which is a general practice for everyone, the Coaches Edition gets down and dirty. A guide for ethics, effectiveness, and excellence, it relates directly to the day-to-day life of athletic coaches. Peak performance coach, author, and speaker, Dr. Alison Arnold, gives you a step-by-step practice to develop the leader within you. The Samurai were 12th century noble members of the military class – the Japanese warriors. The word Samurai comes from the Japanese verb saburau, meaning to serve or attend. A Samurai is both a warrior and a servant. This transformational 28-day practice for coaches melds warrior characteristics (loyalty, respect, ethical behavior, and discipline) with servant characteristics (selflessness, nurturing, empowering) of the amazing Samurai. The integration of these forces leads to ultimate excellence in coaching leadership. Please contact us for special shipping rates on orders of 5 or more books. Doc Ali's latest CD providing drills to train the mind. 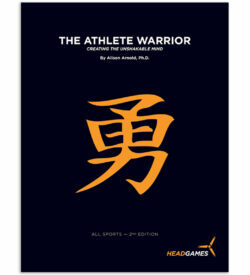 Our most advanced mental training workbook for gymnasts and other athletes.